“Chocolate Land” is one of the outstanding stories of the second biannual International Short Story Contest 2017 written by Gargie Kapil Phadke, India. Once upon a time in a village Rampur, there lived a girl whose name was Ritu. She was a very cute girl. She loved to play and dance. She also loved to eat chocolates, biscuits and cakes. Her mother always told her that “Listen Ritu, eating so much of chocolate is not good for you”. One night when she was going to bed a fairy appeared and said “Ohh! Little girl, what is your name?” She said, “My name is Ritu. I love to play and to eat chocolate too. Do you know that there is big chocolate land? Will you take me there?” The fairy said, “Yes there is big chocolate land in fairy world.” “Let’s go then”, Ritu said as she was jumping in joy. They both reached there. Ritu saw a big ice-cream river and buildings made up of biscuits. Then she went on the terrace of the biscuit building. She saw chocolate trees and houses made of cookies. She came downstairs and climbed up a tree, and then as the wind blew, she began swinging on the branch of the tree. Ritu overjoyed. She ate ice cream of strawberry, mango and many more flavours. She enjoyed Cadbury chocolate. There were small hills of Gems. She rolled on it…she was enjoying, but soon her stomach started hurting, and when she saw her reflection her teeth were almost black . Then she understood that her mother was right. “Ohh! I want to go to home”, Ritu said, and she started crying. When the fairy came, Ritu said to her, “Dear fairy let me go home and I will brush my teeth as my mother says, always brush after eating chocolate”. Fairy said, “Ohh dear Ritu, I will take to you to your home and always keep in mind that you have to listen to your elders.” They both sat on the sledge and went home. 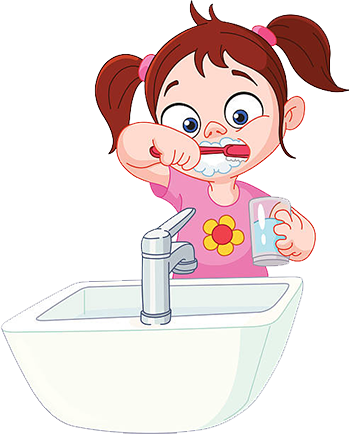 In the morning Ritu woke up and while brushing her teeth she was smiling. For the whole day she thought about her best trip to Chocolate Land in Fairy World.